The Ormskirk campus offers a wide range of spaces, from serious study spaces in the University Library, and LINC to specialist spaces in departments. 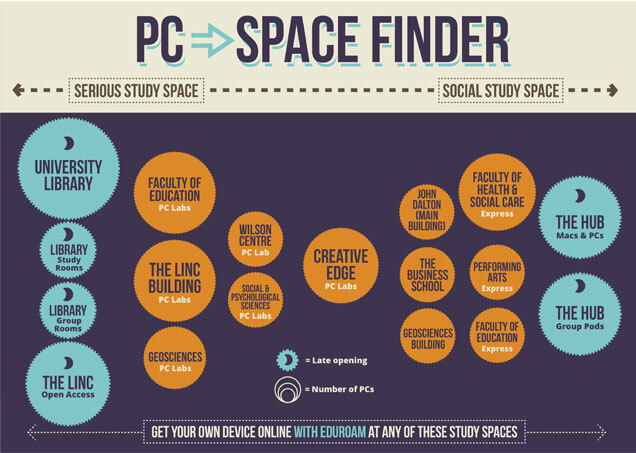 Please find a space which suits your study need – The University Library has lots of spaces to support working on assignments and projects but if you are working collaborative why not try the HUB or if you just want to check your timetable or social media, there are express PCs in lots of buildings. The University Library offers a range of space – for those who need to work quietly, there are bookable study rooms or dedicated quiet and silent spaces on the 2nd Access to the booking system is via the Resources tab in Learning Edge. Wifi access is available across campus – Please link your devices to ‘eduroam’ using your device settings. Learning Services staff can help with wifi settings. If you need help and support finding a space please ask a member of staff in the University Library or get in touch via Ask Us. We are here to help you make the most of the resources and IT across campus. This entry was posted in Learning Services by Rachel Bury. Bookmark the permalink.